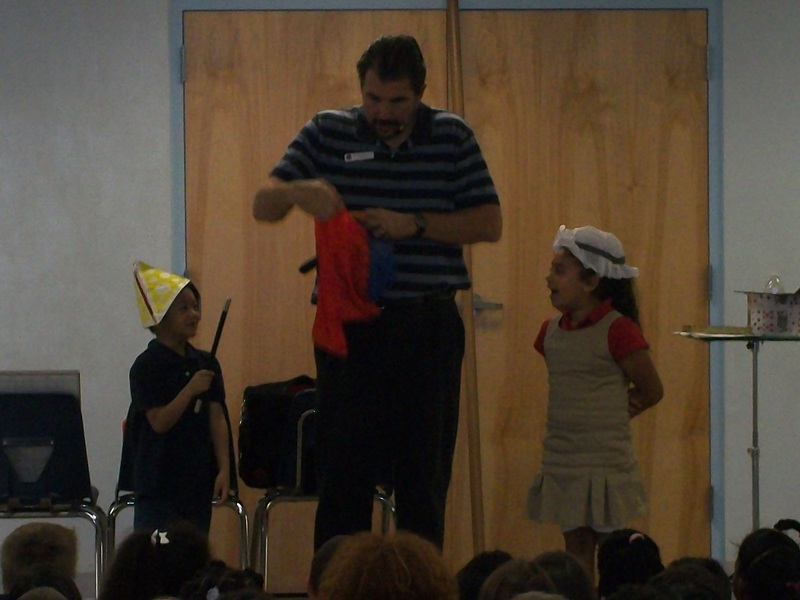 Kinder and first graders assist with the magic show. 21 April — Chris Dixon, a national presenter and magician — performed at the CAS cafeteria for grades k-3 to teach students about electrical safety in a memorable, entertaining way. The presentation was made possible and sponsored by the Sulfur Springs Valley Electrical Co-op and offered at no cost to CAS schools. Dixon wowed the crowd with disappearing and reappearing coins, magical scarves, and a drawing that came to life all while reinforcing safety with electricity. Students learned why electricity and water never mix, how to act safely around power lines, and why plugs are the only things that go into electrical outlets. CAS would like to thank both Mr. Dixon and the Sulfur Springs Valley Electrical Co-op for making this fun and important presentation possible.